A recent post on the remarkable programming of the 'all positive talk' internet radio station, Healthy Life.Net., hosted by over 40 seasoned TV, film and radio personalities, highlighted the This is Life Show. featuring actors and comedians Kathy Buckley, Geri Jewell and Toby Forrest. (left to right:) Each Monday, hosts Kathy Buckley, Geri Jewell and Toby Forrest, share their personal experiences with listeners , as they overcome challenges by seeing the humor on the This is Life Show on www.HealthyLife.Net . Make plans to listen live on Monday April 26th from 11:00 am - 12:00 pm PT/2:00 - 3:00 pm EST, to This is Life,which will include a call-in interview with Howard Renensland, Founder and CEO of [with]tv . Howard is the driving force behind the blog posts you read here, and will talk about the value of building a greater awareness of the need for inclusivity for persons with disabilities. Live listening is (of course) free, but you can also listen to any of the Archived programs, by downloading them at $4.95 per show here. Kathy Buckley: Billed as "America's First Hearing Impaired Comedienne", Kathy is a five-time American Comedy Award Nominee as Best Stand-Up Female Comedienne, and the winner of countless other awards for her work. www.kathybuckley.com. Geri Jewell: Best known as Cousin Geri on the NBC sitcom, "The Facts of Life" was the first person with a disability to have a regular role on a prime time series. . www.GeriJewell.com. Tobias (Toby) Forrest: An actor whose credits include "Weeds" and "Six Feet Under", Toby is also the singer for the band Cityzen. He is a quadriplegic due to a diving accident who has become an advocate for performers with disabilities. www.myspace.com/CityZenia. HealthyLife.Net is an all positive 24/7 Internet Radio Network airing topics you want to hear! Richard Saphir, MD is the pediatrician for both my daughters. 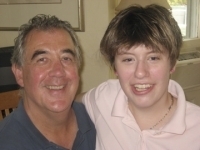 Victoria was first born, now 24 and a young woman with disabilities. Olivia, or Baby “O” as we call her in the Nuclear family was next, is now 19 and studying The Classics and French at The University of Chicago. Needless to say my wife and I always did and do lean on this man heavily. He is the second coming to us, at least medically, and to this day we run all important health related issues for the girls through him. We either just turn around to eye the next gauntlet we must run or simply decompress mentally and physically. Now do not think we are walking Zombies with plastered looks of despair on our faces. We aren’t and we are thrilled and in love with both of our children. I think what this concept of “not celebrating” really hits home about is that you simply cannot celebrate too much. It never is enough and never seems like enough. No matter what we do, time marches on and it’s passing remains incomprehensible to the human mind. I think to do this we must simply live our lives, which is what we do. Like last night celebrating Olivia’s return from college, we just went out to a movie in a thunderstorm on a Monday night. Victoria is terrified of thunder and large cinemas offer respite and on a Monday night of a movie that has been out for a week, in this case Kung Fu Panda, offers a remarkably empty theatre. Reflection seems to be a natural and integral part of the aging process I am finding. Perhaps when one is younger it is just too hard to stop “doing” and spend more time in self-congratulation. I do celebrate more now than I did 20 years ago. Perhaps this is so because 20 years brings so much more to celebrate. There is a lot of outrage in our sizable global community of people with disabilities lately. You can read it in a variety of disability blogs, including our own, and see it in various letters to the editors of major newspapers like the New York Times and others. But that is about it sorry to say. Our feelings, issues, complaints, etc. do not make up much of the content in mainstream media today, nor will they ever, ever, ever. There are a multitude of reasons for this. It is a simple fact. I encourage you to continue to advocate for a bigger piece, better coverage, or a different perspective. Now this does not diminish at all the well articulated and deeply felt responses to the way we are referred to in the New York Times or the way we are ostracized in Florida kindergarten classes, or any of the other public and private degradations that do not make it into the consciousness of mainstream media but to which we and our fellows are subjected every second of every hour of every day of every week, of every month, of every year from before time was measured or history recorded. We stayed at home and attended no Memorial Day Parade or organized activity of any kind. Now before you toss me in the basket with all the other anti-American folks allow me to add that I do have a lapel pin, several actually; a US flag, Easter Bunny, Santa Claus, one commemorating a year of perfect attendance in First Methodist Sunday School – 7th Grade, which was due largely to my desire to be closer to a cute little girl rather than God. The reason for this seemingly anti-glorification of war sentiment is really pretty lame but true nonetheless. My daughter Victoria, who, if any of you know anything about [with]tv, know is my motivation in this endeavor has a true paranoiac fear of any and all loud noises. This includes all guns, balloons, thunder, etc. This makes for anything but an uneventful life and was particularly amusing during her pre k-12 school years when manually filled balloons are as mandatory as a label of “gifted” for a successful school event. It is particularly exacerbated at present due to Victoria’s recent surgeries and extended hospitalization. I guess sort of a post-traumatic stress syndrome reaction. Anyway, we avoid any and all celebrations on Memorial Day. On the 4th of July, forget about it. We simply leave the country for spots that for some odd reason choose not to celebrate America’s Independence; at least not with firework displays and the odd string of firecrackers set off in the middle of the day in the middle of the street. My intent in starting [with]tv was to create a media home for top of the line programming about the many aspects of disabilities and the people who live with them. Additionally I hoped to create a welcoming, accessible, and inclusive environment where both my daughters could work. My logic being that people with and people “without” disabilities are inter-dependent on each other. Make sure you get that. You need me and I need you. Secondly and more importantly I feel the lack of a mainstream, inclusive, accessible cross media voice, that strives to employ at all levels and in all areas all manner of those in our community is the single greatest limiting factor marginalizing people with disabilities individually and as a group globally. This weekend as I “caught up” on the discussions of many disability blogs, news sources, etc. (for God knows there is scant mention of us anywhere else) I was sorely reminded of this need. I have recently become aware of Mr. William Peace and his writings on a Bad Cripple through Connie Kuusisto, Blogmaster at the blog for [with]tv and PWdBC, two businesses I have started. As key volunteers, Connie and her husband Steve have been boundless with their energy and support and instrumental in helping us go forward. I would characterize them as Batman & Robin, but I am not sure who wears which cape. I am also aware of the fact that they have their own "Rin Tin Tin" in the person of Nira, Steve's guide dog. Rumor has it that Connie has on her own taught Nira to wash and dry dishes along with offering an opinion on new wall colors and carpet samples for their new home. Knowing what she has taught me about blogging I see no reason to doubt this.